Screen Printing (SP): Price includes a 1-color barrel imprint. 4 colors available on barrel, 1 color on clip. 1 color imprint only on barrel with clip imprint. 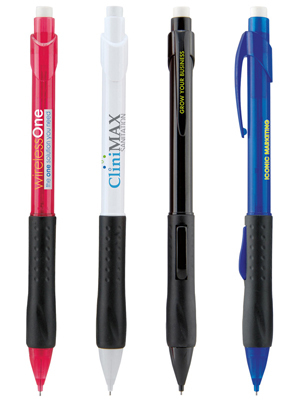 Add $.12 per pencil for each additional imprint color or clip imprint. See diagram for imprint area, location and number of colors. Choose pencil color from selection shown All include black grip.